Let me start off by saying I love modern retellings of fairytales. So I ws totally stoked to devour The Selection on the plane ride home from the RT Booklovers Convention in Chicago. And the only reason I managed to snag a copy was because I'd just so happen to spot it in a fellow book blogger's bag while she was rearranging it. I'd saked hr if they were giving ARCs out at the Convention but she answered "no." By pure luck, she also said that I could have the copy she was carrying because she had an extra one at home. To top it off with sprinkles: it's signed! Readers began the story by meeting America Singer, a seventeen-year-old who lives as a Five. The caste system of Illea is rather interesting. Being a One means you are Royalty while being a Eight means you are homeless. Fives are the Artists. "And artists and classical musicians were only three steps up from dirt." America is a performer, a musician, who sings while her mother plays the piano. Her younger sister, beautiful and boy crazy May, is an artist like their Dad. Their little brother, Gerard, hasn't found his talent yet but then again he's only seven. While America's family - father, mother, younger sister and her little brother - aren't exactly starving, they can't have seconds at dinnertime either. Addressed to the House of Singer was a letter in the post. All young women of age between 16 and 20 were encouraged to enter in the Selection, a lottery. And if selected, one girl from each province would go on to compete for the crown as a the future bride of Prince Maxon and princess of Illea. It is a once in a lifetime opportunity. "Participants will be housed at the lovely Illea Palace in Angeles for the duration of their stay. the families of each participant will be generously compensated for their service to the royal family." Only problem is: America doesn't want to be a One. What she wants is to be with Aspen Leger. The one who makes America's heart skip. The one she is forbidden to be with. Her secret for the last two years. The boyfriend she breaks Illea's strict rules and curfew to date unbeknowest to her family. Why? People marry up, like America's older sister Kenna, not down. And Aspen is a Six. Sixes are those you call when you need help with cleaning or serving at a dinner party. But after America finds out she has been choosen to compete for the chance to be the princess of a war-torn country, Aspen ends their relationship. Practically forced by her caste climbing mother to participate in the Selection, America accepts her bid and makes way to the palace with the thirty-four other girls. She decides that she may as well use her time at Illea Palace to benefit her family. Who knows, once the Selection was over and done with, maybe she'd be able to utilize her new status as a Three to help her loved ones then. Besides, it isn't like Aspen would miss her while she was gone. Except, there is an unexpected hitch in her plan: Prince Maxon Schreave. 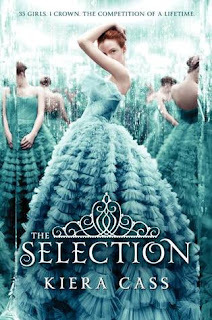 The Selection is a story about a girl who just wants to be with the guy she loves, but instead ends up capturing the heart of a prince who isn't who she thought he was. And normally that would be an easy notion to disregard. But, instead of the stuck-up little wimp America pegged him to be, Prince Maxon is, in fact, a shy, compassionate person trying to find his place as a individual other than just the guy with the title of The Prince. Kiera Cass' debut Young Adult novel is a soft, endearing read that will open your eyes to the possibility of a different happily ever after. The Selection has a little bit of everything for a variety of readers' tastes. There's dystopia, a love-triangle, a prince, a fairy-tale theme, a brooding beau and more.